Yes, it's real heatwave weather this week and Mum and I absolutely loathe it. It feels as hot as Hades (or should that be Tartarus?) Actually, hot as Hades sounds much better to me. Mum says it's because of the alliteration. Of course as a goddess I should be able to freeze out this heat whenever I want. But unfortunately this is real life and I can't, but I can give your human some top tips on how to keep you cool and safe in this evil heat. So here are my top 5 tips on keeping your cat cool in summer. Make sure your cat has access to a shady area (both indoors and out, and especially if you are going to be out of the house all day). If your cat is an outdoor cat it’s best to keep them inside during the hottest part of the day. Make sure your cat has plenty of water to drink. An automatic water fountain is great, especially if you are going to be out of the house for a long time. On really hot days you could place an ice cube in the cat’s water bowl. Wipe your cat down with a cool damp cloth or towel. Some cats may not like this at first, so be gentle. If you have a white cat be sure to apply a high factor sun cream to their ears and nose. And remember, do not use one that’s meant for humans as the chemicals contained could be harmful to your cat. Instead, ask your vet to recommend one. Always be aware that heat can be deadly so keep a look out for heatstroke. We have lots of air conditioning here, fortunately - and my human doesn't take me out during the hottest parts of the day. Good advice! It's hot here in north Wales, so I know it must be unbearable down south!! I asked my cat bro Bert about how he stays cool and he said he was born a cool cat and will always be a cool cat. I think he may have misunderstood me and his ego came out instead. That's some really good and important advice, Athena and Mum Marie. Thank you. We sure hope it cools off there for you soon. THe heat is really getting to us...wish that we didn't have so much hair! We are strictly indoor cats but we don't have air conditioning! We are having a heatwave here too and it gets pretty warm in the house even though mom shuts it up when it starts to warm up and turns on the fans. We do better than her, though, since we like it much warmer than you humans. 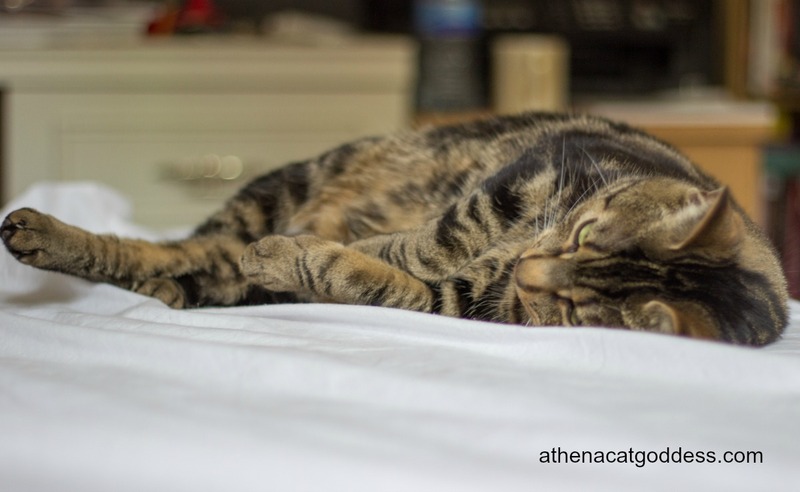 Excellent advice, Athena! It isn't always easy to tell when a cat is getting too hot, so prevention is the best way to go. Things haven't gotten very hot where I am right now. Our weather is weird. Thanks for keeping us in good health!!!! Great tips! Our cats stay indoors and hang out in the basement (which is extra cool) on really hot days. Very important post. I keep mine indoors so they are keeping cool.